From left to right - 'Siren', 'Ikuntji Church' and 'Coober Pedy' by Chrystal Rimmer, 2017. In 2015, Chrystal Rimmer spent nine weeks at Ikuntji Artists, an aboriginal artists centre situated in MacDonnell Ranges in the Northern Territory. The Ikuntji community instilled in her the importance of family, spirituality and understanding ancestry, and this experience sparked the creation of this new body of work, titled ‘Famiglia: Oh Holy Father‘. Rimmer embarked on a journey of self-discovery that took her to Arcade in Treviso, Italy to meet her extended family and learn about her descent. ‘Famiglia: Oh Holy Father’ is an immersive family tree – a series of paintings of relatives and sacred spaces. While figurative the works are guided more by what Rimmer felt than what she saw. 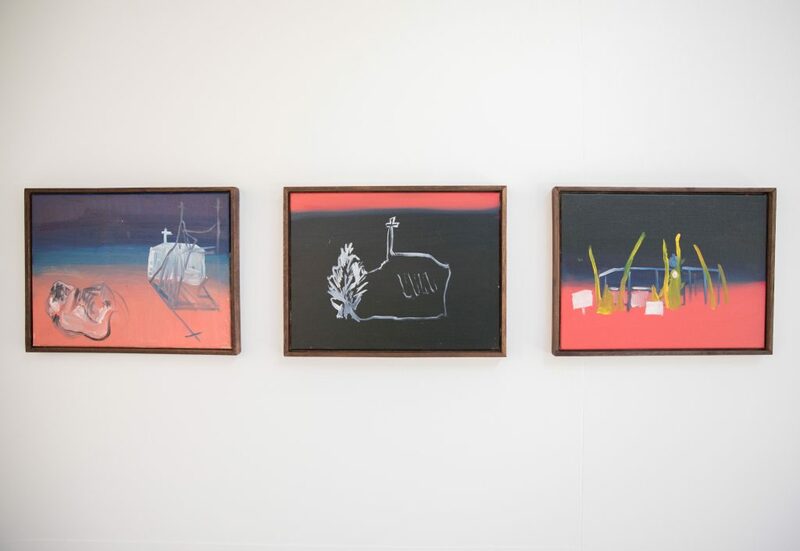 Architectural elements prevalent in Rimmer’s past painting series are present in these works as abstracted habitats. These habitats reflected her mood when creating the work and are at times representational of her subject’s personality. Rimmer treats the canvas like a paper and the process of painting like sketching –predominately using charcoal, graphite and pastels. Colours have been inspired by her days wandering the Uffizi Gallery in between family meetings. Constructivist and Romanticist notions are visibly in the work – Rimmer describes these styles as an innate part of her visual vocabulary. Through the work, Rimmer is asking a very personal set of questions: Who am I? Where do I fit? How do I interact with this space? While personal, these questions explore universal ideas of belonging and heritage – relevant to all of us. Through her work Rimmer suggests that tolerance for multiplicity could be grown through the discovery of our own personal identities. When it comes to our make up there are no borders, and we are all connected in ways we wouldn’t expect. What is “Australian” anyway. Chrystal Rimmer is a recent BFA graduate of the National Art School, Sydney. She lives and creates work in Merimbula – a small town on the south coast of New South Wales, a place she describes as having “limited cultural diversity”.